Brewery BREWORX OPPIDUM is the industrial medium-size brewery with the special brewing system designed for production big volumes of wort. The wort brew machine is equipped with six multifunction tanks that allow a parallel production up to six batches of wort at the same time. Microbrewery BREWORX OPPIDUM of our production has not its name by accident. Oppidum was a Celtic fortress in which the original settlers in the Bohemian area produced predecessor of today beer at a time when the wars between the European tribes take a pause for a moment . Also the wort brew machine BREWORX OPPIDUM reminds a fortress whose design is not purposeless. The integration of all containers needed for the wort production process into a single unit on a common platform, as well as the complement of the machine with dedicated boiler for boiling wort with hops and separated whirlpool tank, allows the most efficient beer production up to six simultaneously prepared batches. Thanks to that the wort brew machine enables the production of up to 5 batches of wort per 24 hours in the production of beer types prepared by the decoction method, or even up to 6 batches per 24 hours in the production of wort using the infusion. 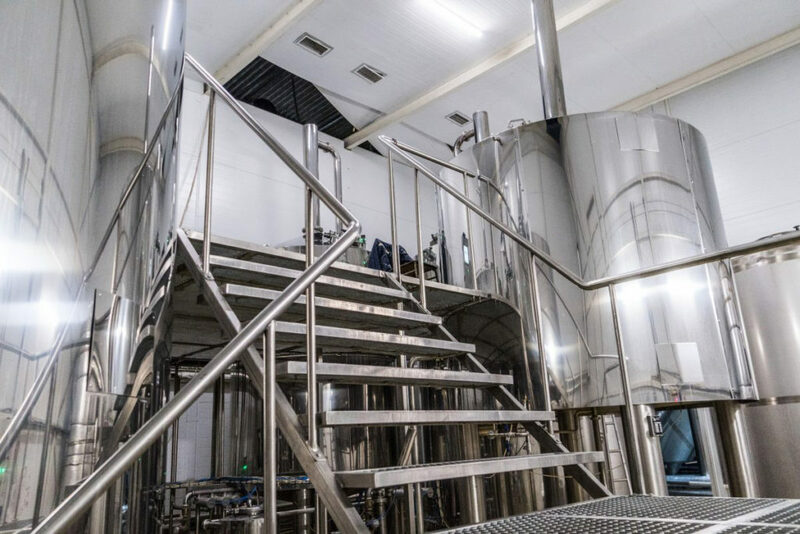 With easy serviceability of all vessels of the brewhouse from one platform the brewer in his fortified settlement has a brewing technology constantly under control, without the need of frequent movement around the brewery. The small distance between the brewing and support vessels helps to minimize escapes of heat and its efficient recovery. 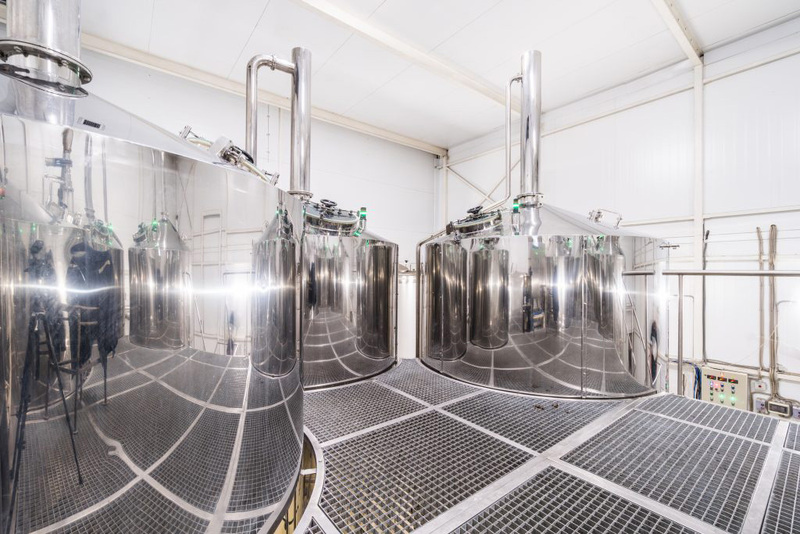 Unlike stand-alone containers the integrated solution of the brewhouse has further advantage of significant savings in space for the brewhouse which the brewery occupies, when calculated per hectolitre of beer produced. Planned daily production corresponds with a large-scale fermentation and maturing tanks. 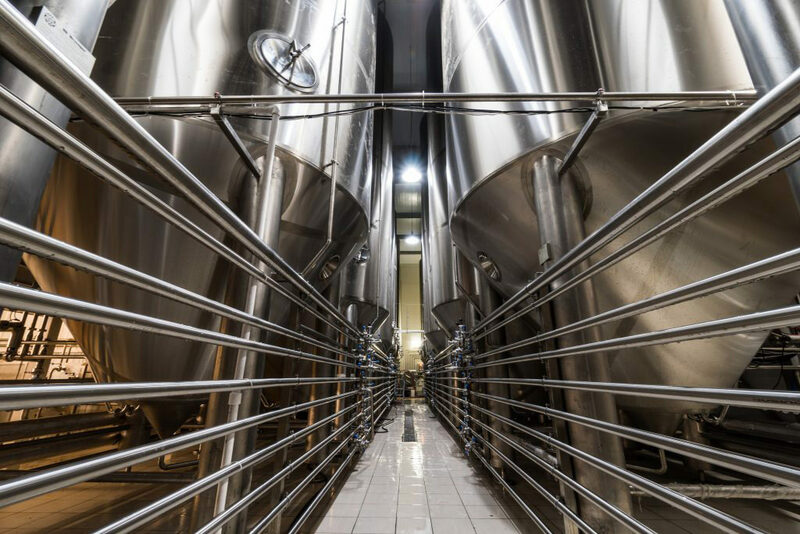 Like the brewhouse, in the same area of the brewery in the tanks there can be located substantially more beer than would be possible with a classically solved brewery. This makes the area of a brewery cellar maximally used, and allows the production of larger quantities of beer on the layout area. We produce minibreweries BREWORX OPPIDUM in three variants of the main fermentation and arrangement of the tank storage. 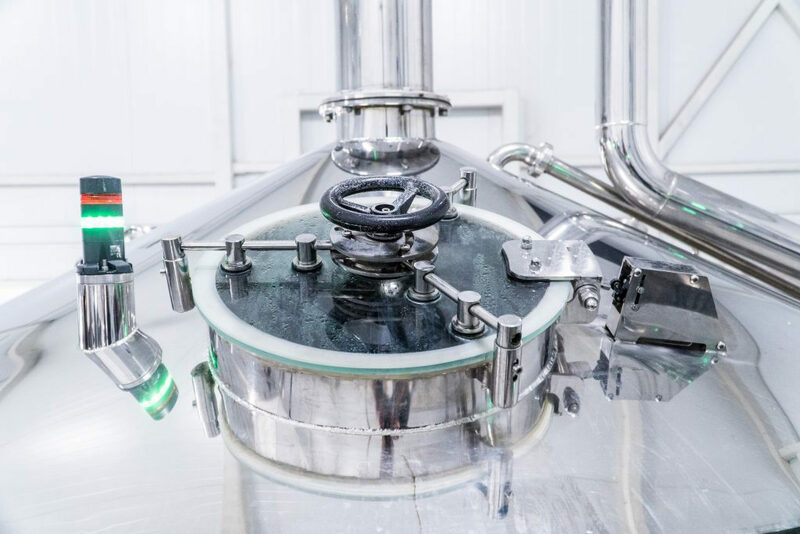 Fermentation and maturation in sealed cylindrical-conical tanks is an effective and modern way of producing beer, which is highly resistant to contamination of fermenting beverages with unwanted organisms. Precision control of the fermentation and maturation leads to permanent results of constant quality and sensory characteristics of the beer. This scheme of brewery is particularly suitable for the production of top-fermented beers, but it is possible to produce all types of bottom-fermented beer too. Fermentation and maturation in open fermentation vats is the traditional way of producing beer, especially for the typical bottom-fermented Czech type of beer . This allows collection of quilts during the fermentation. A fascinating look at many forms and colors of the yeast foam will be appreciated by guests on excursions to the brewery. This scheme of brewery is suitable only for the production of bottom-fermented beers. Production of top fermented beer in open fermentation vats is quite demanding and is therefore not recommended . The combined solution enables production of bottom and top-fermented beer. Minibrewerie contains of open fermentation tubs (optimal for the traditional method of bottom-fermented beers) and cylindro-conical tanks (particularly suitable for the production of top fermented beers). Beer maturation takes place in lager tanks, or it is possible to use instead of lager tanks other cylindro-conical tanks for maturation process. The solution particularly suitable for restaurant minibreweries where the brewer plans to manufacture both bottom and top fermented beers . 1. Brewhouse: 1.1 Brewhouse: Mash kettle primary, 1.2 Brewhouse: Mash kettle secondary, 1.3 Brewhouse: Lauter tun, 1.4 Brewhouse: Wort storage tank, 1.5 Brewhouse: Wort kettle, 1.6 Brewhouse: Whirlpool, 1.7 Hot water tank (boiler), 1.8 Ice treated water tank, 1.9 Wort heat exchanger , 1.10 Water treatment, 2. Fermentation: 2.1 Fermentation , 2.2 Maturation tanks, 2.3 Serving tanks, 3. Hot steam generator, 4. Cooling: 4.1 Glycol Cooling Unit + Ice cooling water tank, 4.2 Plate heat exchanger for cooling the wort / hot water production, 4.3 Plate heat exchanger for ice water cooling, 6. Sanitation: 6.1 Mobile CIP pump, 6.2 * CIP station, 7. Production of industrial gases: 7.1 Compressor, 7.2 Wort aeration stone, 7.3 Beer pushing inert gas, 8. Yeast management: 8.1 Yeast tank, 8.2 * Propagation station for growing yeast strains, 9. Beer filtration: 9.1 * Primary and secondary filter, 10. Bottling and salling of beer: 10.1 * KEG Washing and Filling maschine, 10.2 * Distribution and sales of beer * 10.3 Tapping of beer. 1. Brewhouse: 1.1 Brewhouse: Mash kettle primary, 1.2 Brewhouse: Mash kettle secondary, 1.3 Brewhouse: Lauter tun, 1.4 Brewhouse: Wort storage tank, 1.5 Brewhouse: Wort kettle, 1.6 Brewhouse: Whirlpool, 1.7 Hot water tank (boiler), 1.8 Ice treated water tank, 1.9 Wort heat exchanger , 1.10 Water treatment, 2. Fermentation: 2.1 Open fermentation tubs , 2.2 Maturation tanks, 2.3 Serving tanks, 3. Hot steam generator, 4. Cooling: 4.1 Glycol Cooling Unit + Ice cooling water tank, 4.2 Plate heat exchanger for cooling the wort / hot water production, 4.3 Plate heat exchanger for ice water cooling, 6. Sanitation: 6.1 Mobile CIP pump, 6.2 * CIP station, 7. Production of industrial gases: 7.1 Compressor, 7.2 Wort aeration stone, 7.3 Beer pushing inert gas , 8. Yeast management: 8.1 Yeast tank, 8.2 * Propagation station for growing yeast strains, 9. Beer filtration: 9.1 * Primary and secondary filter, 10. Bottling and salling of beer: 10.1 * KEG Washing and Filling maschine, 10.2 * Distribution and sales of beer * 10.3 Tapping of beer. 1. Brewhouse: 1.1 Brewhouse: Mash kettle primary, 1.2 Brewhouse: Mash kettle secondary, 1.3 Brewhouse: Lauter tun, 1.4 Brewhouse: Wort storage tank, 1.5 Brewhouse: Wort kettle, 1.6 Brewhouse: Whirlpool, 1.7 Hot water tank (boiler), 1.8 Ice treated water tank, 1.9 Wort heat exchanger , 1.10 Water treatment, 2. Fermentation: 2.1 Open fermentation tubs , 2.2 Closed fermentation tanks, 2.3 Maturation tanks, 2.4 Serving tanks, 3. Hot steam generator, 4. Cooling: 4.1 Glycol Cooling Unit + Ice cooling water tank, 4.2 Plate heat exchanger for cooling the wort / hot water production, 4.3 Plate heat exchanger for ice water cooling, 6. Sanitation: 6.1 Mobile CIP pump, 6.2 * CIP station, 7. Production of industrial gases: 7.1 Compressor, 7.2 Wort aeration stone, 7.3 Beer pushing inert gas, 8. Yeast management: 8.1 Yeast tank, 8.2 * Propagation station for growing yeast strains, 9. Beer filtration: 9.1 * Primary and secondary filter, 10. Bottling and salling of beer: 10.1 * KEG Washing and Filling maschine, 10.2 * Distribution and sales of beer * 10.3 Tapping of beer. 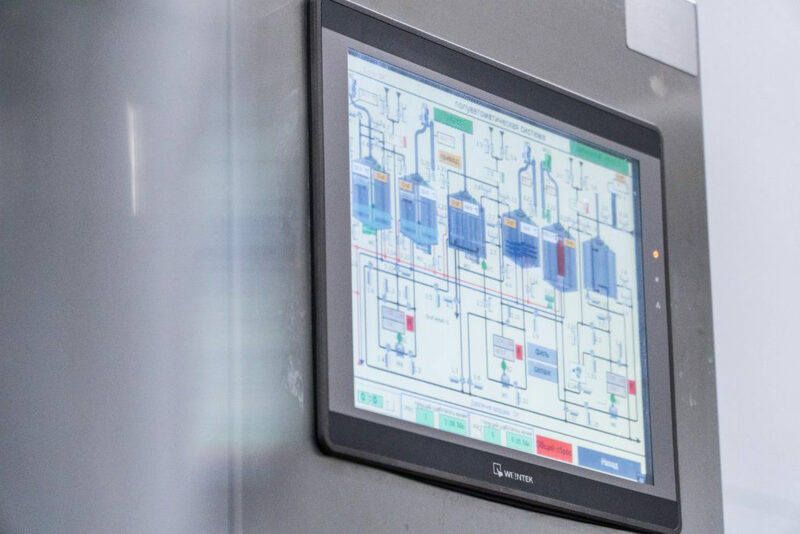 The semi-automatic control of the brewhouse with the support of PLC with most operations controlled from the central control panel with controls and sensing elements. The control panel is designed as a touchscreen – centrally are controlled motors, heating and opening and closing several important valves on the media pipes. The most valves and flaps on the brewhouse pipe system is controlled manually. Automatically controlled brewhouse – with most computer- controlled operations – according to the specifications from a central control panel. The control panel is designed as a touchscreen. The brewer selects the recipe and starts the program that fully controls the production process. 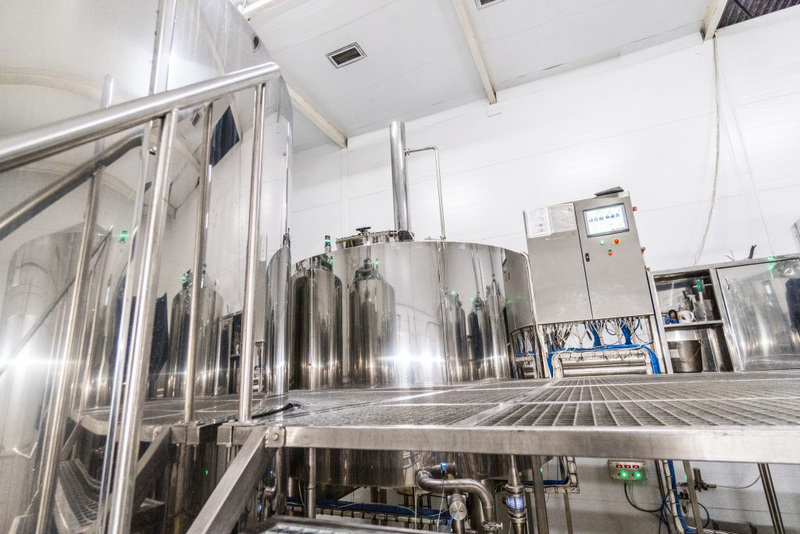 The brewer controls it and performs laboratory tests, treats abnormal conditions and ensures the preparation and the brewing of raw materials for the process.